The work starts in the spring when farmers thin the apple blossoms. "An average tree has 4,000 blossoms, and they cull them down to 200 to 400," she says. Each flower consists of a set of five blossoms -- one in the center, surrounded by four more, she explains. Farmers climb ladders to carefully pluck the four outer blooms, leaving only the center one. This creates fruit that is 30 percent larger than American apples, the standard size expected in Japan, she notes. 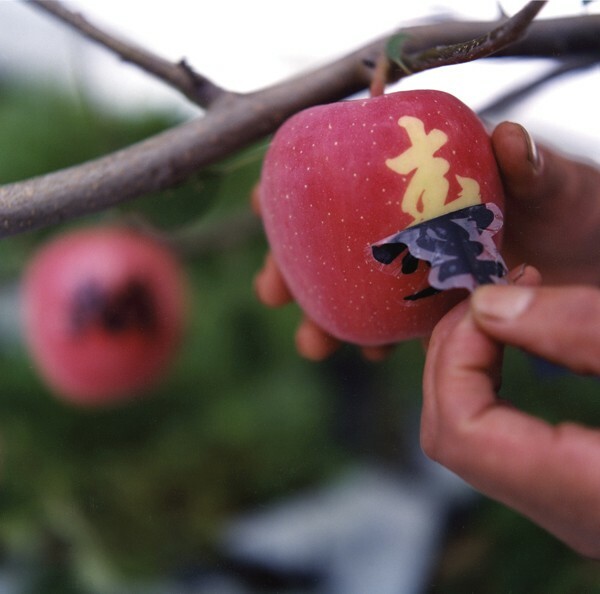 For the biggest, most perfect apples, they also apply sticker-like stencils to create designs on the apples' skin. "The stencils act like a high-contrast negative," the professor notes. "Some have sayings on them, such as, 'Best wishes for a long life.' Some are negatives with pictures. One Japanese pop star put his picture on apples to give his entourage for presents." More details at the link. Via Edible Geography, where there is additional information on the history of "branding" and putting stencils on fruit. My friend who lived in Japan complained about how hard it was to get fresh fruit like here in Europe. Even things like strawberries and grapes came tastefully arranged in a small box and individually selected for perfection, and are very expensive.